Day 3 & Onward: $300.00-$700.00 daily. Our total for the first week was ~= $15,000.00. We have plans to start a series of posts like this and continue sharing statistics. With the profits earned, we immediately invested $1,600.00 in an expert ebook designerand copy editor. The ebook has been not only proof-read and edited for spelling and grammar, but we’ve produced a brand new design with beautiful cover art, sensible typography which makes it much easeier to read, and better organization of content (182 pages full color). We’re relaunching the product today with this new version, which also includes 2 brand new interviews and a matching Amazon Kindle and ePub format for easy reading on your preferred ereader device. Everyone who already bought a copy should have received an email with all these updates, free. Continue to site. 39 Bootstrapped & Successful Side Projects. Turning ideas into projects is difficult. We asked 39 successful entrepreneurs tough questions on how they went from their idea to a successful side project. 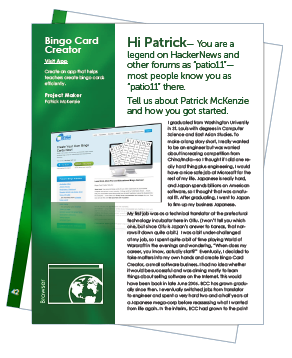 39 in-depth interviews with project makers featuring 2 NEW interviews in v1.5! Everyone should have a side project, read this book - if you don’t have one it will pound it into you. Get this book and start learning from real-world examples. How successful project creators turned their passions into a source of passive income. 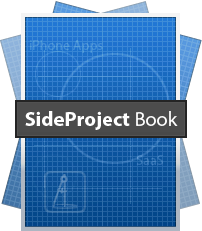 How one app developer sky-rocketed his project to a top 10 app in the iPhone App Store. Turning a shoe-string budget web site into a $50,000/year income producing project. Going from indie Mac Developer to being featured in a top blog and driving thousands of downloads all over the web. Building an iPhone app with no coding experience, and being featured on Oprah, Mashable, and Good Morning America. ...And many more stories from the projects below. *Use Adobe Acrobat Reader for best viewing. Special thanks to David Bradbury for helping put this page together. What was your big differentiator? The main thing that differentiates HackerNode from other hacker news reader apps is good UX. I have spent a lot of time to make sure the interface is smooth and intuitive. For example on the iPad you will notice that the cascading animations are very smooth and realistic. I have spent a lot of time getting this right. What technologies are you using now? As I grew in programming ability, the BCC marketing site transitioned from a static HTML site to a Ruby on Rails application, largely because this allowed me to conveniently publish large amounts of bingo-related content. (I have 942 or so individual bingo activities, with the intent of ranking for any activity a subject could possibly want to teach a lesson about using bingo.